Professional golfer Nelson Mudanyi is one of the best golf payers in the country. 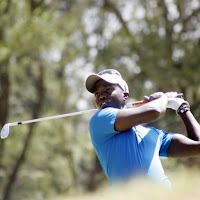 He won numerous titles before turning professional back in 2012 and he is currently stationed at the Muthaiga gold club, where he rubs shoulders with the likes of former president Mwai Kibaki. Nelson who is currently positioned at number 1707 in the world ranking of professional golf players, had his career peak back in south Africa where he stayed and played for a year. He currently travels around the world participating in various tournaments. But apart from his great achievements, the guy cannot keep his drilling machine in his pants. When he lived in South Africa, he impregnated a girl and ran away from the responsibility. According to the lady, Nelson requested her to have an abortion which he was willing to pay for, but the girl refused and that's where the problems began. Nelson who was trying to protect his career, decided to ran away and became a 'ghost' throughout the pregnancy period. After the lady gave birth,and the baby was five months old, Nelson went back to look for the lady, claiming he wanted to see his daughter and never even left a singer cent for the up bringing of the child. The lady (Name withheld) says she doesn't want his money, but that he should be responsible enough to provide even for the baby's daily bread. The baby's mother still wonders how Nelson could leave them like that, spending his time travelling and sleeping in expensive hotels while his baby lives like a refugee.